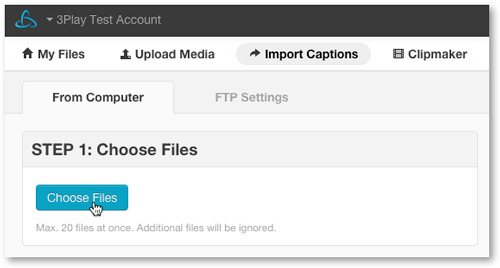 Closed caption files that were not created by 3Play Media can be imported into a 3Play Media project as a “master” file using the caption import service. Contact your 3Play Media account rep or 3Play Media support to activate this service as it is not available by default. From the My Files page click Import Captions. 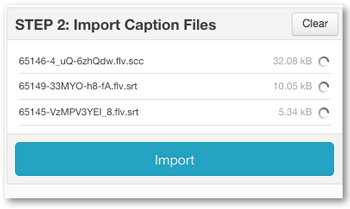 After clicking Import Captions click Choose Files and select up to 20 closed caption files at a time from your computer. If more than 20 are selected, the additional files will be ignored. After selecting the closed caption files, click Import. After clicking Import a menu will appear where you can select import options. First select the language that your files are in from the drop down list. 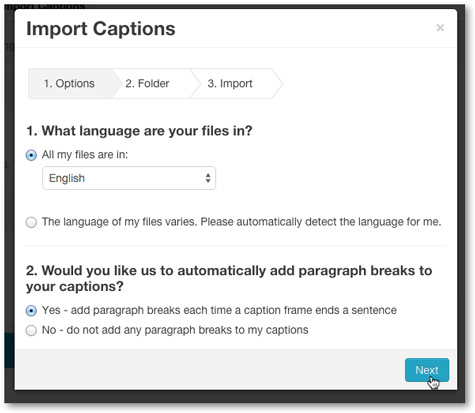 If the closed captions being imported are in a variety of languages, use the option to automatically detect the language of each file. Select The language of my files varies. Please automatically detect the language for me option if you are unsure of the language of some or all files. 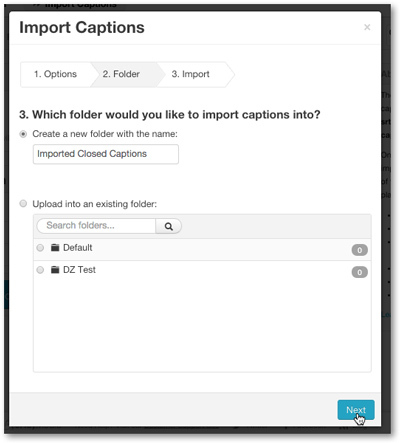 By default captions imported to a 3Play Media project will automatically add paragraph breaks each time a caption frame ends a sentence giving the output a cleaner looking, easier to read formatting. If you do not want do not add any paragraph breaks to imported captions check the button next to No - do not add any paragraph breaks to my captions. Click Next after choosing from the available options. Next either create a new folder or select from an existing one from your project. The folder selected here is where the captions will be located once imported. Once a folder is created or selected click Next. 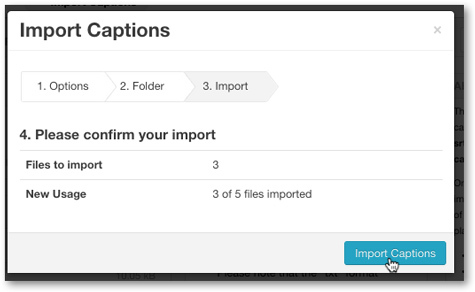 After assigning the destination folder an overview will display showing the number of captions for this import and of the overall usage of your subscription shown next to New Usage. Please note that New Usage factors in the captions that are about to be imported..
Click Import Captions after reviewing the overview. After clicking Import Captions the process will begin processing the closed captions.